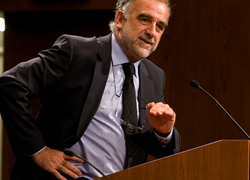 Tag Archive | "Luis Moreno-Ocampo"
On November 2, 2011, the I.C.C.’s Chief Prosecutor, Luis Moreno-Ocampo, announced that because of allegations of crimes committed by NATO forces, “allegations will be examined impartially and independently by the Office.” Although the report concerning these allegations will not be presented until May 2012, the investigation alone shows the importance of accountability for all the parties involved in the Libyan revolution. Damien McElroy of The Telegraph notes that reports continue to emerge that NATO air strikes violated the scope of the Security Council’s resolution by targeting and killing civilians. For example, before the final days of the regime, pro-Gaddafi forces alleged that NATO killed more than eighty-five civilians in an air strike in the town of Ziltan. Furthermore, one of the regime generals, Khaled Hemidi, filed a lawsuit in a Belgian civil court accusing NATO of killing his wife and three children in separate air strike incident. The validity of such reports remains to be seen. It highlights, however, that each party will be investigated to determine responsibility for the violations. Nonetheless, much of the international community views the military intervention as the right action. In a recent article, the Economist noted that “[i]t is difficult to imagine a stronger case for military intervention to prevent war crimes . . .” and that “it was clear from the beginning that the NATO intervention in Libya was driven by the broad commitment of Western governments and their publics to aiding democratic transitions and stopping murderous repression.” If such widespread support was the foundation of the military intervention into Libya, then an investigation and subsequent finding of an international violation could de-legitimize all subsequent military interventions taken by regional organizations. Regardless of the alleged violations, NATO’s presence remains hotly debated by Libya’s interim government. The Libyan interim leader asked NATO to prolong its presence through December in an effort to continue its air patrol and place military advisors on the ground amid worry that remaining loyalists might regroup and resume fighting. Nevertheless, the Security Council unanimously voted to end foreign military intervention in Libya on October 29, effectively ending all foreign intervention. In sum, the statement made to the Security Council highlights the importance of placing the responsibility of any crime committed on the right party. However, the problem remains three-fold. First, if it is determined that NATO did violate the scope of SCR 1970 by targeting and killing civilians, it remains to be seen whether the International Criminal Court will have the capability to bring a claim against NATO. Second, if such a claim is brought, it could diminish the ability of regional organizations to act by using force in similar cases. Finally, although Libya remains stable, there is still a chance that foreign intervention might be necessary. Regardless of whether NATO intervention led to civilian deaths, many would argue that the end of NATO involvement came too soon following the death of Qaddafi.